I was in the mood for sitting on the beach, sifting sand through my hand, staring at the ocean. Alas, while the weather would be lovely for sitting on the beach, I don’t have time to GO to the beach to sit. So, I made a card instead. Supplies: Stamps – Hero Arts, Stampin’ Up!, paper – Neenah Classic Crest Solar White, Stampin’ Up! Pacific Point, Real Red, Swarthmore Bristol, inks – Papertrey Ink Fresh Snow, Stampin’ Up! Pacific Point, Real Red, Tim Holtz/Ranger Distress Ink Tumbled Glass, Vintage Photo, die – Taylored Expressions, embossing powder – Filigree Fine Art Powder white. Categories: card, caring, I love you | Tags: card, Hero Arts, Neenah, Papertrey Ink, Ranger, Stampin' Up!, Taylored Expressions, Tim Holtz | Permalink. Thanks, Mike! I should have dedicated it to you. Have a great Friday! Cool card! How did you get your great sand effect? Thanks so much, Gillian! I blended both the sky & sand with a foam ink blending tool. 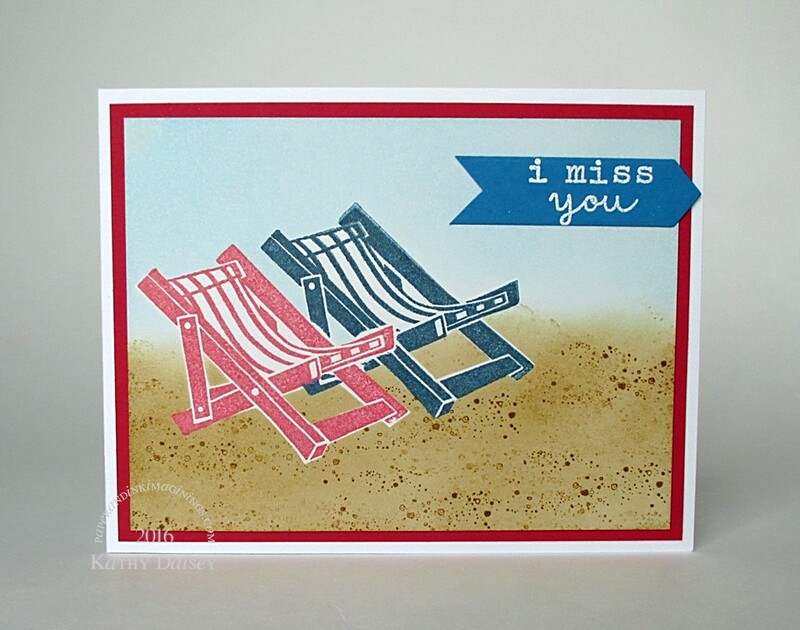 Then, I went back over the sand with a “sand” rubber stamp (retired Stampin’ Up!) in the same color of ink that I blended. I did stamp it 3 times before reinking (so the sand grains look different colors). A sand stamp sounds so useful. Shame they retired it. It was part of the beach chair set. They also had a set called “Itty Bitty Backgrounds” that had 4 stamps of various sized random dots that I have used for sand (also retired). You have a stamp that is like snow falling? That would work, too. Or maybe your falling snow is really a die? If so, cut it out of scrap paper & use it as a stencil for your beach. Haha! Falling snow die is definitely too big – it would look like a meteor shower had hit, but my snowing stamp would work brilliantly. You little beauty, Kathy! It’s true – you are! Psst! I think you are as well, sometimes these things take 2 sets of eyes! Love how you created this sand!